Some people collect old canning jars (I have a few of those), and some folks collect old apothecary jars (I have a few of those too) - but my favorite jars to collect are chunky, over-sized jars with wide mouths in which I can show off a collection inside. I find this to be a neat & tidy way to display my smaller collections because they are easier to keep clean (jars are a cinch to dust off), and they are out in the open to be looked at and enjoyed instead of tucked away in a drawer, suitcase or closet. 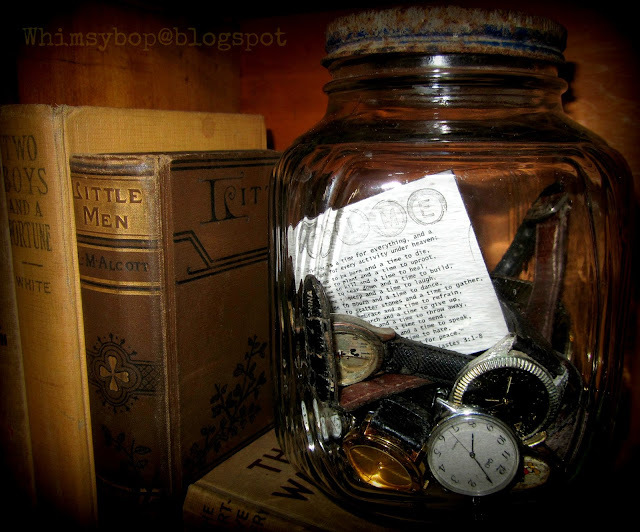 Every now and then when the mood hits me I include a quote, verse from a song, poem, or scripture from the Bible which adds a little thought or whimsy to the jar and makes the contents a little more meaningful and/or fun. This next jar isn't as much of a collection as it is a constant reminder that I am queen of procrastination! I transferred the film into this jar from a shoebox when we moved here four years ago and it's so darn cute that the urge to develop the film has left me. I started getting lazy about film developing after we started using a digital camera. I'll bet this film is at least 12 years old - Yikes! 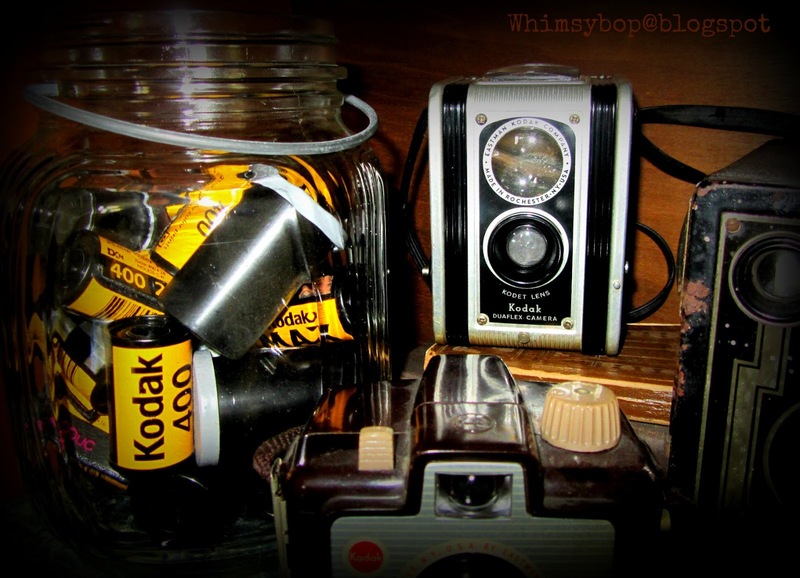 I keep the jar on a shelf, with a few old cameras that I love, perched on top of the family stack of high school yearbooks. This jar of vintage cookie cutters is the eye candy that I keep on my kitchen shelf along with my chrome canisters and cookie sprinkles - all things that make me happy when I'm baking up something good in the kitchen. I have a quirky habit of rescuing Scrabble games from yard sales & thrift stores. When the game is a fairly new one, I dump the tiles into this jar. 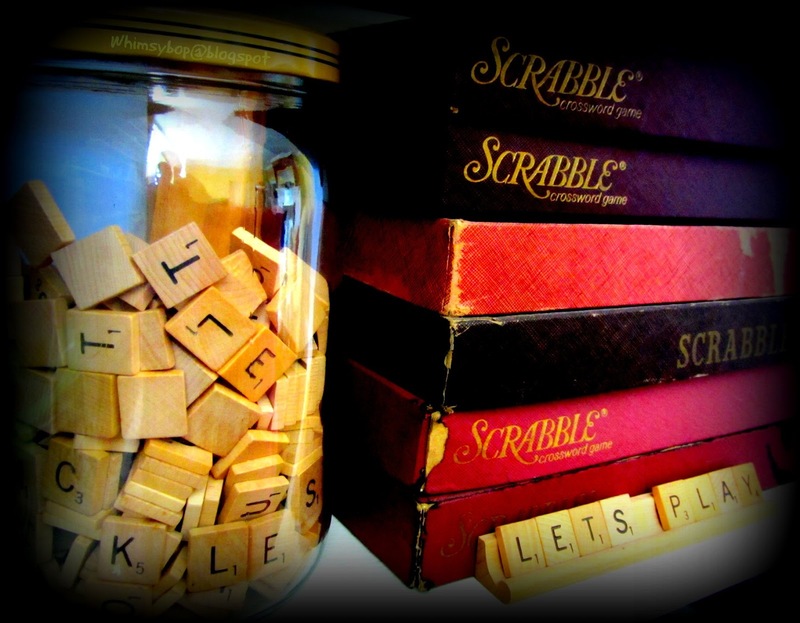 I get a kick using the tiles to spell out little "notes" around the house. 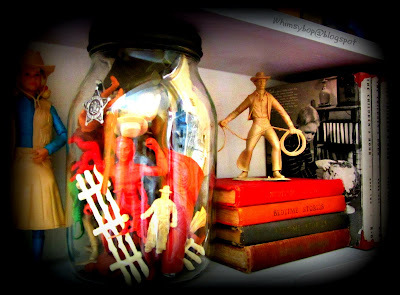 This last jar is filled with vintage cowboy & Indian plastic toys that are waiting to be placed into a "Wild West" themed shadow box that I've been wanting to make for a few years now. I love these old vintage toys by the Louis Marx Toy Company - such classics! The jar shares a shelf with my vintage "Uncle Arthur's Bedtime Stories" books (wholesome and wonderful stories from the 1940's) that I collected and read to my kiddos when they were young. Hey! I feel an idea coming on! Since I have so many more collections in jars that I'd love to share with you, I'm going to feature "Collections in a Jar" for the entire month of April (try to CONTAIN your excitement), so stay tuned for "Collections in a Jar: The Sequel!" P.S. 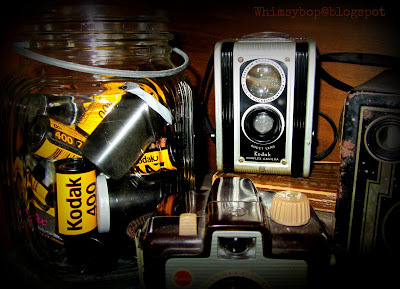 I'd love to see photos of your collections in a jar - please post them on my "NEW" Whimsybop facebook page! Click here to link to Whimsybop on Facebook! I love the old wide mouth jars too. I also have a few of the blue ball jars. It's fun to see how you used them! I have a few of the blue ones and they are sooooo pretty! I can't wait for my daisies & black eyed susan's to come up and bloom - they look adorable in those blue jars! :) Thanks for stopping by Deb! 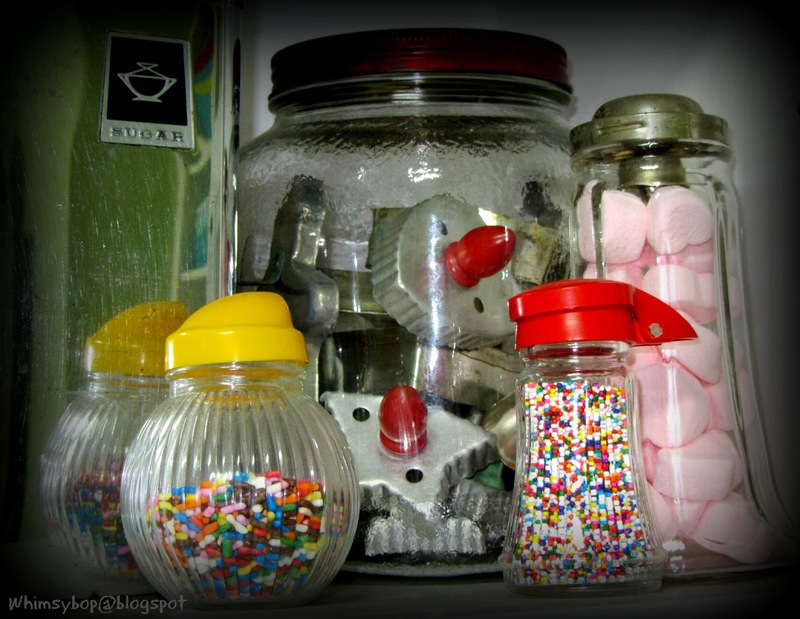 Girl... your jars full of treasures are beautiful! Now I am wanting a bazillion jars--- cause if it fits-- it is going inside a jar! cause thats just to darn cute!!!!! I'm glad you are inspired to shop for a bazillion jars (you're so funny) - you go girl! :) Thanks for visiting my blog, I peeked in on your blog and enjoyed it very much - I will definitely visit again when my yard work is caught up and there's more time to play!